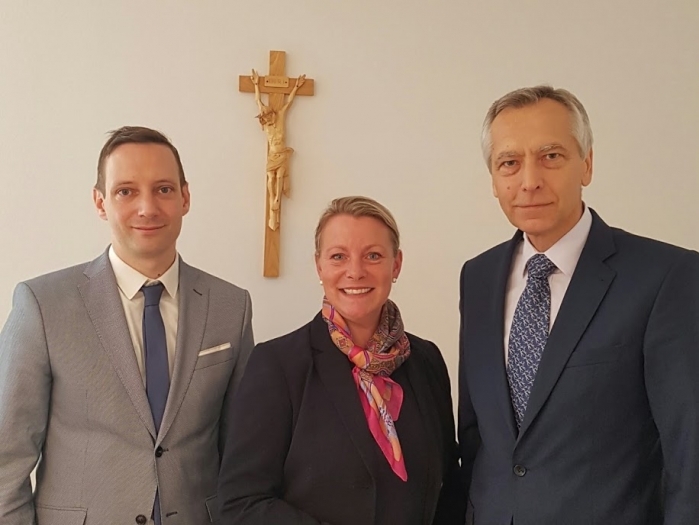 Ellen Fantini joined Ján Figel', EU Special Envoy for the promotion of freedom of religion or belief outside the EU, and Tristan Azbej, Hungary's Deputy State Secretary for Persecuted Christians, on a panel in Bratislava. Fantini said that the Observatory’s task is to analyze the situation for Christians in Europe, not in order to compare or diminish the persecution they experience in other parts of the world, but to stay vigilant in the protection of human rights such as freedom of conscience. She gave examples from the Observatory's most recent report of conscience rights violations in Europe, as well as cases of threats and violence against Christians. Figel' reminded the audience that Christians are the most persecuted religious group worldwide. He emphasized that respect for freedom of conscience is of the utmost importance, noting that it is from this freedom that others flow: freedom of expression, association, and the rights of parents. Tristan Azbej explained his government's "Hungary Helps" initiative which provides direct aid to Christian communities where they have been most affected, such as the Nineveh Plains in Iraq. He described the flagship project, the reconstruction of Telsqof, a city in Iraq close to Mosul. Most of the buildings there were destroyed by the Islamic State. Hundreds of houses were reconstructed, allowing a thousand families to return home. During the press conference following the seminar, Figel' said that the European Union has the resources to help those who are persecuted for their beliefs. And, according to Figel', the current crisis is also an opportunity to change attitudes. "It is a challenge not only for the European Union in Brussels but also for the Member States, including Slovakia, to create, as Hungary has, the structures and prerequisites for more effective assistance to the persecuted," Figel' said. The seminar, under the auspices of MEP Anna Záborská, also included a panel discussion on international law and foreign policy.